When I see pumpkins and other Thanksgiving decorations at the grocery store, I know that my favorite season is here – fall! I love this time of year – smelling cinnamon in the air, finding all the new varieties of pumpkins, and of course, seeing the leaves with their rich colors of reds, oranges and browns. Print out these Thanksgiving-themed placemats for your child to color! Roll out a large sheet of brown craft paper across your dining room. Add several small cups of crayons to the table, and encourage guests of all ages to draw and write what they are thankful for on the paper before and during the Thanksgiving meal! 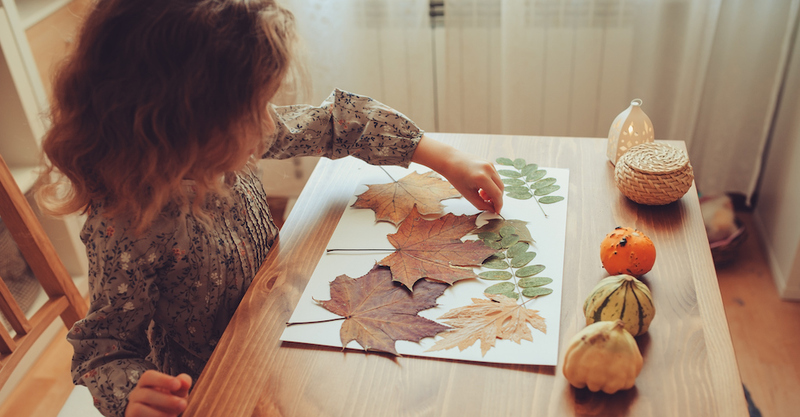 This simple activity will help your children show gratitude in a tangible way by sharing what they’re thankful for (and practice their motor and literacy skills!). Click here for instructions. Help your child trace his hands onto several sheets of fall-colored construction paper and then cut out each hand shape. Next, add a googly eye to each thumb and ask your child to write one guest’s name onto the palm area of the hand shape. Your child can then add a small orange triangle for a beak to create a “turkey hand placement” for each guest. Children love going on nature walks, especially during the fall! Take a walk in the park or in your neighborhood and help your child collect interesting leaves, pine cones, acorns and other pieces of fall foliage. Once home, you can work together to either paste the items into different designs on sheets of construction paper or use non-toxic gold paint to add shimmering designs to individual items (feel free to incorporate mini pumpkins, too!). Once everything is dry, you can place the artwork around the house or put painted items in a glass vase for an easy festive centerpiece. We hope these activities will help make Thanksgiving a blast for you and your little ones!